Deep in Bolivian Amazonia, thousands of local people are out collecting softball-sized pods. These nut-filled pods lie around the feet of the towering Brazil nut tree. Each year from December to March this giant of the forest sends its fruit crashing to the jungle floor, providing the desperately poor inhabitants of the region with their only cash crop. 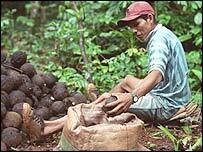 As well as sustaining the local people, the Brazil nut helps keep the jungle standing. If removed from its ecosystem the tree simply ceases to fruit. But the market for this socially and environmentally sustainable nut is incredibly fragile. The slightest over-production can trigger a price collapse on global markets, leaving harvesters with less money to take home and their families without enough to eat. In Bolivia's most remote department, El Pando, the Zafra (harvest) breaks the lazy rhythm of tropical life as half the population gets down to collecting, transporting or processing the Brazil nut. "It is the only option for more than 20,000 people here," said Enrique Nelkenbaum, general manager of a local firm, Tahuamanu. 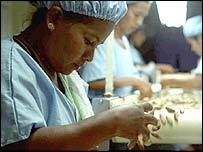 Shelled Brazil nuts are exported to Europe and the US from Tahuamanu's plant in Cobija and around 20 other centres in the Bolivian Amazon. Contrary to expectation, Bolivia is the world's largest producer of shelled Brazil nuts. In fact, the chances are when you buy a packet of Brazil nuts, or a Brazil nut product in any High Street store, what you are actually getting is a Bolivian nut. 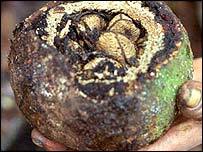 The Brazil nut, or castana as it is locally known, earned its international name during more than a century in which exports of all nuts from the region were controlled by a few Brazilian families. When the rubber sector collapsed in the 1980s, the castana suddenly became the economic heart of the Pando - and Bolivia's national industry began to develop. Twenty years on, and in Tahuamanu, Bolivia boasts the world's most advanced castana processor. The company has set the lead in quality selection and contamination controls needed to meet stringent European Union requirements. Tahuamanu is also one of only two firms that has achieved organic certification. But all Brazil nuts are 100% natural and the trade is the only money-maker here that does not destroy Bolivia's rainforest. Yet for all the environmental benefits the castana only offers a harsh and precarious existence to the poor Bolivians who depend on it. Harvesting the nuts is heavy work. On an average day each worker collects a "barica" of nuts (a local measurement weighing 60-70 kilograms), and carries this huge load for up to two hours to the nearest collection point. The current price per barica is around 45 bolivianos (£3.70 or $5.80), meaning an average season income of around 4,700 Bolivianos (£386 or $608) per harvester, barely enough to provide for a family. Yet this is a relatively good year. In October 2001 the price per pound of shelled nuts collapsed from expected levels of around $1.15 to an historical low of 70 cents. 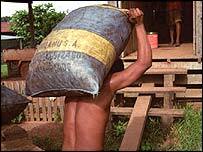 The biggest hit was taken by the harvesters, the price per barica plummeting to only 25 bolivianos. "When the price falls like this there is no money to buy food," lamented Rojer Quesara, representative from a rural workers' union. The impact is evident - in the swollen stomachs of the young, and the studies showing 80% of rural children in Pando now suffer from malnutrition. This human disaster came about as result of a small rise in world production of shelled nuts from 14,000 to 16,000 tons. "The market is inflexible," explained Martin O'Toole, Europe's biggest Brazil nut importer, who says demand for Brazil nuts is flat or even falling. Despite its unique environmental advantages and critical social impact, the castana gets squeezed out by 350,000 tons of mass-produced Turkish hazelnuts or the 450,000 tons of almonds grown in Californian plantations. Yet being so small means that with only a small push the castana could rise as easily as it has fallen in the past. "Just one successful product could make all the difference to the industry and the communities who depend on it," said Martin O'Toole.